Perlite - what is filtration of liquids? Filtration, the separation of solids from liquids is one of the most widely used operations in industrial processing. The wanted material may be either the liquid or solids, depending on the finished product. In many systems where the solids content is low, but the filtration resistance is high, the filtration can be done most efficiently and economically only by the use of filter aids. In this process the filter septum (cloth, screen, porous stone or metal) serves principally as a support for the cake. The filter aid forms a porous layer on the septum and thus the filterid is the filtering medium that traps the solids being removed and prevents them from "blinding" the screen. A filteaid is fine material which when added to the liquor being filtered helps control flow and solids removal. It does not interfere chemically with the liquid being filtered , and is not readily compacted nor compressed by the exertion of pressure. 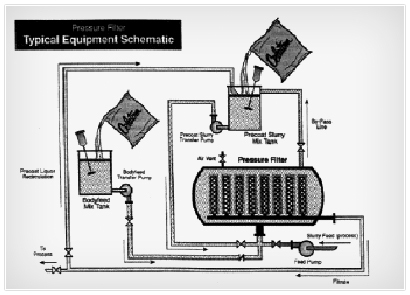 Filterid filtration is a mechanical, not a chemical action. It is "straining" on a micro scale. Irregularly shaped particles interlace and overlay in a fashion that leaves 80% to 90% voids or open spaces. These voids form billions of microscopically fine interstices between the filterid particles. The size of these openings is so minute that unwanted solids (even in the subicron range) are "strained" from the liquid. The vast number of the openings compensates for their small size resulting in fast flowrates and brilliant clarity. Good filteraids are light in weight; chemically inert; and form high porosity filter cakes to maintain free flow of the liquid. Form a very porous cake. Structure of particles must be such that they will not pack together closely, but will form cakes that are 80% to 90% pores. This not only permits high initial liquid flow but also provides pore spaces to trap and contain the filterable solids and leave a high percentage of channels remaining open for flow. Resistance to flow is created by the viscous shear of the liquid over the surface area of the filteraid particles. Therefor the smaller the surface area, the higher the flow. Because fine particles having higher surface area cut down flow, and coarse particles give poor clarity, the narrowest possible range of particle sizes (within a given grade of series of filteraids) is best.. Particle size distribution must be "tailored" to include enough very coarse particles to permit precoating on coarse wire and synthetic screens. The percentage of coarse particle necessary for precoating is small and does not adversely affect flow rate or clarity. Grades of filteraid must range from fine to coarse to suit various solids removal requirements. A great many materials have been tested as filteraids. Those made from perlite have been most successful and widely used in industrial filtration.